Lets Organize Your Resume-By now you should have visited my previous pages, and have in your hands a printed new resume. Stay with us, as Organize Resume, where you are now, will show you the difference in your resume when you make it stand out. By Skills: This is more for people who have moved around in various jobs. Listing your skills first will define the experience you have for a particular position you are applying for. This might help define you as a very experienced person for the position, although most employers prefer to see a chronological resume. By Date or Relevance: Yes, this is your more basic chronological layout we mention above. When you use this, you will list your current job first and then follow the list down with your previous jobs you held in the past. Most employers prefer this date or relevance resume, as it shows them really how long you have been employed in the past. Also lets them know the gaps you may have in your employment history. Yes we all realize organization and attention to detail is the key to success. Whether you’re a Vice President of Marketing or a recent college grad, your resume is the ‘key’ to opening the doors of employment. With only 60 seconds to make a first impression, it is imperative that your resume be as organized and professional as you can possibly make it. Skim your new resume as if you were the person doing the hiring. What parts stand out? Think about what words or sections jumped out at you, circle them in red, and use them within the body of your new resume in a bullet style fashion. Today's job market is increasingly competitive, sometimes hundreds of people apply for the same job. This competition means that certain parts of you message are more important today than others have been in the past. In general, the resume writer wants to stress the employment-related skills, achievements, awards/honors, responsibilities, duties, and actions that make him/her a good candidate. So organize resume to make it stand out better. 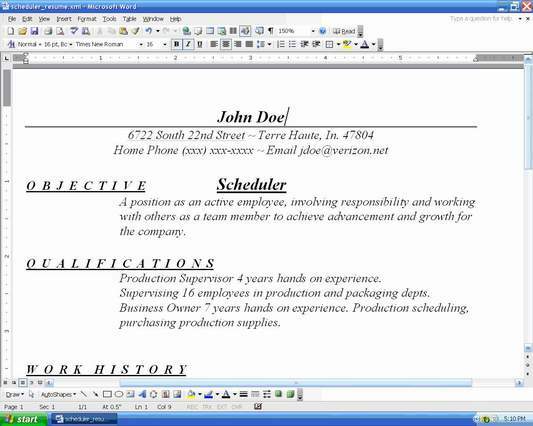 Lets organize resume as I mentioned before, by laying out all of your past jobs on a sheet of paper, then start highlighting the most eye catching features. I like to bold face type all of my red circled features on my new resume in a bullet list under the previous job. Example 1: See how the bold text above, stands out from the rest of the article drawing your attention to it? Example 2: Knowledgeable in quality procedures, lock/out tag/out procedures and MSDS procedures. Production scheduling, purchasing production supplies. Get your Qualifications more organized and make them a bold, bullet list, like the example below, to make them pop out. lock/out tag/out procedures and MSDS procedures. Production scheduling, purchasing production supplies. Now if I were to glance this article over again in say 30 seconds or so, what do you think I see? Sometimes hundreds of people apply for the same job. Also I see your highlighted experience that you created with a bold bullet list. So I am going to sort your resume out of the stack of resumes and put it in the keep list for a second look. Again, sometimes 5 to 6 people sit at the conference table and go through the stack of resumes in front of each of them. Some in the no section, and some in the yes section. Organize it with everything you can, to make it stand out. 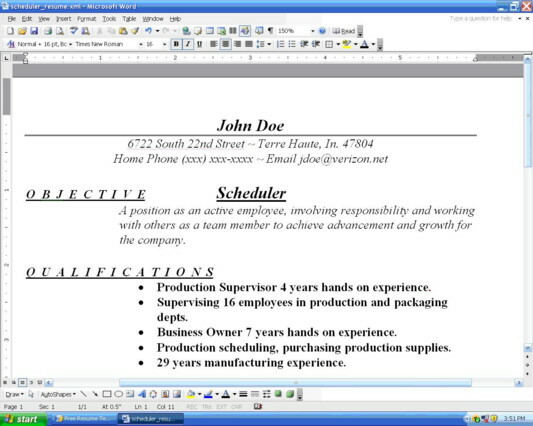 Check out the Organize Resume tips on the two examples below. Now doesn't the top example stand out better. At first glance I see John Doe---Scheduler---Qualifications, all 5 in bold and all organized with bullets. The second example, I kind of have to decipher the qualifications myself, and I just don't think that's a good idea, when you can make it stand out yourself. After you get the resume you printed out at the end of the Resume Draft section, looking like example 1 above, in the top picture, stay with us a little longer and go to the next section, Review Resume for more tips. Check out the Inside pages for More details on organizing your resume. Return to Free Resume Templates to find your new resume.